NLI’s Director of Stewardship, Zach Grycan, and Melissa Grycan, Restoration Ecologist for The Land Conservancy of McHenry County, will lead the Prescribed Burn Training Workshop. Learn how to conduct a prescribed burn and tips on best practices from both, who are experienced prescribed burn managers. The workshop will be based on Chicago Wilderness’ Midwest Ecological Prescription Burn Crew Member Training Manual. 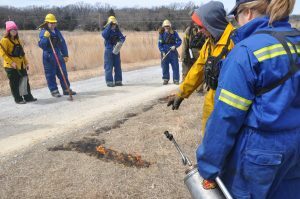 Participants will receive hands-on learning when they assist with a prescribed burn (weather permitting) in the prairie at NLI’s Foss Farm. To register please call: 815/964-6666 or send your name, address, affiliation (if any) and payment by March 29, 2019 to Natural Land Institute, 320 S. Third St., Rockford, IL 61104, or fill out the form below. Please enter number of registrations. Please click on "+" sign to add additional lines.